Churchill Stonecast Blueberry is inspired by the changing seasons with its charming colour palette and stunning design. Reviving the rural allure of this archived Churchill crockery collection, this crockery set features fine speckles and golden brown edges which are hand painted to ensure every piece of crockery is truly unique. Blueberry is inspired by the familiar colours of the british summer fruit and the UK harvest season. The tone of Blueberry is deeper but inviting giving it a vibrant, unique tabletop presence. Many items in this exciting catering crockery collection have a 5 Year Edge Chip Warranty for long lasting reassurance. 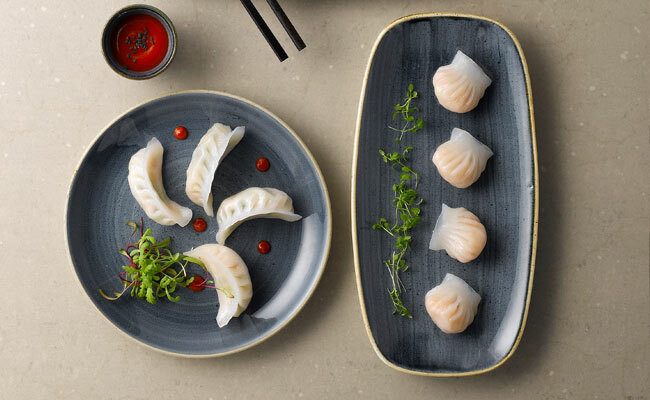 With a Super Vitrified Body and Superior Glaze Finish, Stonecast ensures outstanding quality and is perfect for bars and restaurants looking to add style to food service. Shop the range of Churchill Stonecast crockery available online at Pattersons and choose to mix and match your catering crockery. Pair your Blueberry Stonecast restaurant crockery with any of the following Stonecast crockery sets to choose a combination that is unique to you. Choose your Churchill Stonecast from Pattersons Catering Supplies and find the perfect shade for you. At Pattersons Catering Supplies, we stock a large range of catering crockery, including a vast selection of Churchill China, which allows you to be creative in your food presentation. If you have any questions about the range of Churchill Stonecast, or any of the Churchill China we stock here at Pattersons Catering Supplies, get in touch with the customer services team at web@pattersons.co.uk.